--What do your remember from recording the album? 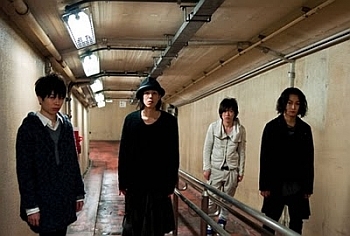 Yamaguchi: Before this album, we didn’t discuss the rhythms of the songs and stuff with Takeda [bassist]. But this time Yojiro [Noda] told us about the level he wanted to achieve with the music and the direction he wanted to go with it. He discussed this with Takeda and I, and we thought about the rhythm of the arragement. So recording went smoothly. Again, just being able to confirm the basics was new for us. Takeda: What’s stuck with me is how bright and fun the recording process was. Each song we recorded, we said to each other “This is good!” and we were deeply moved when each one was finished. N: Takeda was completely unruffled. I wonder if there weren’t parts of some songs that were saved because of Takeda’s mindset. There were parts that I’d get totally absorbed in, and Takeda would be right there with me every time. When there was something he couldn’t do, we’d think “Why can’t we do this?” and a depressive atmosphere would take over. We’d work so hard for it that we’d start to forget that we needed to play what we loved like we loved it, but Takeda would always keep his composure. N: Yeah, it was great. (laugh) It’s the kind of thing you have a hard time saying to someone face-to-face. Kuwahara: Also, this album was our first time have the sound engineered, which was unique. We had to prep for recording in a different way. There were new people to work with, and I think it was a fun, good direction to move in. N: Yeah, they put together a great sound for us. Whenever we got lost in the middle of recording, we could ask for advice. With that song there, it really is a "Desperate Situation"
--The strength of the lyrics compliments the strength of the music. The music is encased in candid lyrics. N: I couldn’t just say things that way that you usually do in songs. I didn’t sing to a specific target; there are a lot of songs that are thematically alone on the album. -- “Daidarabocchi” is one of those songs, isn’t it? N: Yes. This was the very first level of song that I was able to put on the demo. This song marks the point at which I was able to do other songs. --So this album took shape because you broadened your creative horizons, and this song was the turning point? N: I’m not sure exactly what order I wrote them, but I think that this song is the very center of both conscious and unconscious ideas. When I look at the whole album, “Daidarabocchi” is the song that symbolizes the album, and there are songs like it scattered through the album. The feeling was like, “I said that in ‘Daidarabocchi,” so I can say this in this song.” They lyrics are linked together like that. The sound is as well. --You end with “Kyuuseishu” [“Saviour”]. N: It would be wrong not to end with it. With that there, it really is “Zettai Zetsumei” [“Desperate Situation”]. I wanted to end it the right way. I know there are a lot of songs that express the opposite of a “desperate situation,” but I wanted to end the album properly with something that would contradict it.